The Greenbox irrigation controller optimizes garden watering based on local weather, your own preferences, and regional restrictions. Access it from anywhere over WiFi. Traditional sprinkler controllers water your lawn and garden based on a fixed schedule that doesn’t change whether it’s raining, snowing, or extra dry outside. Greenbox is changing that by monitoring your local weather conditions and automatically adjusting them so your grass and plants get just the right amount of water – no more, no less. Greenbox saves you up to 50% in outdoor water consumption. 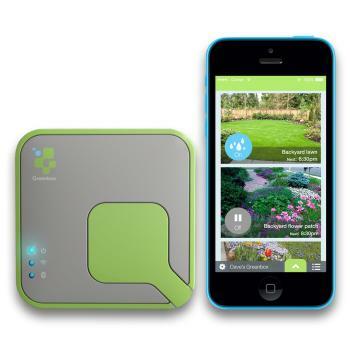 Not only will Greenbox save you water and money, it will be your personal gardening assistant, helping you maintain a beautiful and healthy yard. Using an sprinkler controller doesn’t have to be a frustrating experience. Greenbox is the world’s first truly intuitive irrigation system, and was designed with real people in mind. The gorgeous app guides you every step of the way, and if you still need help, you can contact our support team any time. Through its sleek mobile app or web interface, you can monitor and control Greenbox from anywhere in the world using your smartphone, tablet, or computer. With the unique Watergain irrigation algorithm, Greenbox harnesses the power of hyperlocal weather data to calculate how much water your lawn and garden actually need. The system then adjusts your watering schedule accordingly, so if it’s pouring outside you won’t waste water, and if it’s especially dry and hot out, Greenbox will make sure your grass doesn’t dry up. Connect up to 8 watering zones to Greenbox. One of the zones can optionally be configured as a master valve to prevent leaks. And even though Greenbox already monitors local weather data, you can still connect a standard rain sensor or soil moisture sensor to Greenbox to automatically stop watering if rain or moisture is detected. In addition to WiFi, Greenbox offers Bluetooth Smart connectivity. It enables a faster, smoother setup process, and allows local access to Greenbox directly from your smartphone, even during WiFi outages. Install and set up Greenbox easily within minutes. If you can hang a picture on a wall, you can install Greenbox. Simply fasten Greenbox to the wall, connect your existing valve wires to Greenbox’s terminals, plug it in, and launch the app. You will then be guided through a few easy steps to connect Greenbox to your WiFi and to set up the initial watering schedule. Your up-to-date watering schedule will be saved both on the Greenbox controller itself, as well as in the cloud. Your preferences will be backed up too, so no matter what happens to your phone or Greenbox controller, all of your data will be securely backed up in the cloud. Greenbox communicates securely and privately using HTTPS/SSL and 128-bit encryption.